"I came up with the glaze for this ham using ingredients on hand and it's the best I've ever tasted. If you have any glaze left over, you can add it to the pan drippings with a little flour or cornstarch and make a nice sauce to accompany the meat. Use the bone and ham trimmings to make soup afterwards." Preheat oven to 325 degrees F (165 degrees C). Place ham in a roasting pan. In a small saucepan, combine brown sugar, pineapple juice, honey, orange juice, orange zest, Dijon mustard, and ground cloves. Bring to a boil, reduce heat, and simmer for 5 to 10 minutes. Set aside. Bake ham in preheated oven uncovered for 2 hours. Remove ham from oven, and brush with glaze. Bake for an additional 30 to 45 minutes, brushing ham with glaze every 10 minutes. 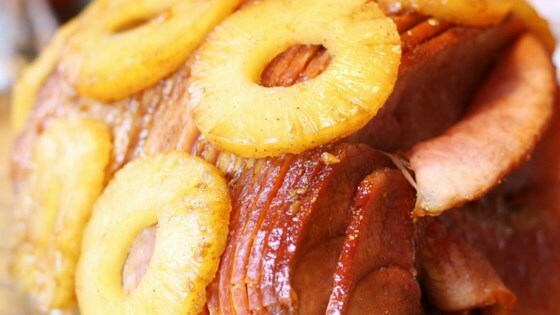 Pineapple juice, honey, and Dijon create a tangy glaze for baked ham. Excellent! My only variation of the recipe was that I spiked the ham with whole cloves and so I left out the ground cloves. From now on I will always use this recipe for my holiday hams.